We had an amazing group of men who were excited and ready to learn at the recent No Man Left Behind Essentials Training in Phoenix, Arizona. There was such a teachable spirit displayed throughout the entire weekend. The guys also seemed to grasp the concepts really well and the final activity of putting tangible plans on paper yielded some really impressive results. It was great to see guys from different churches, demographics, and denominations connecting during the breaks and discussion times. I even heard of a pastor from one church planning to connect with a lay leader from a neighboring church for a hike later this summer! 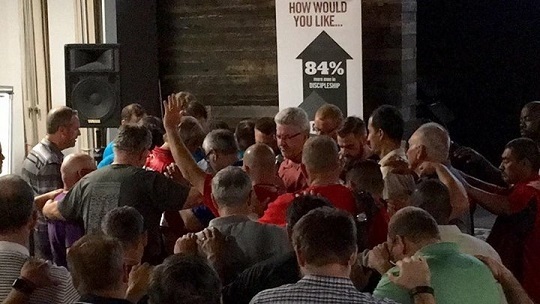 Perhaps the highlight of the training was a unique opportunity this group had to hear first-hand from a man in the “Hurting Man” category and to be able to pray over him less than 72 hours before he was to go in for major surgery. If you want to bring a No Man Left Behind training event to your area, please contact Bryan Richardson, our Leadership Training Coordinator, at 407-472-2119.